Rubber curemeter is used to Control rubber quality, do rapid inspection and rubber basic research. Rotoless Rubber Curemeter is suitable for the determination of rubber shear modulus changes during the process of sulfide, and the shear modulus is proportional to the crosslink density, so the determination results reflected the rubber crosslinking degree of change in the process of vulcanization, rubber vulcanization rate can be detected and are sulfur vulcanization time and return the original and other important parameters. 2. Control system: adopting computer control and touch screen + PLC control module for data collection, storage, processing and printing test results and curve processing, the default time to extend or shorten the testing process, curve, history curve matching, and other functions. 3. The rotation system: adopting Permanent all synchronous motor + amplitude regulator. 4. The temperature control system: adopting intelligent digital temperature control instrument, Automatism adjust PID control parameters in real time. Looking for ideal Raw Rubber Vulcameter Manufacturer & supplier ? We have a wide selection at great prices to help you get creative. All the Rubber Sample Vulcameter are quality guaranteed. 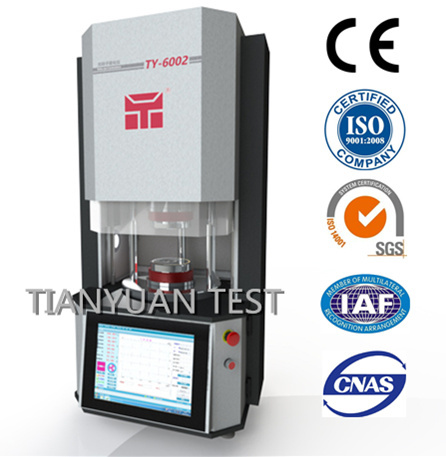 We are China Origin Factory of Lab Rubber Vulcameter. If you have any question, please feel free to contact us.